Whether baked, boiled, deep-fried, grilled, roasted, or sautéed, shrimp makes a wonderful snack or main course for anyone who loves seafood. With such succulent meat, it’s no surprise why shrimp is a delicacy throughout the world. They are great on their own as the main course for a dinner party, or they work wonderfully as ingredients for pastas, rice dishes, kabobs, and so much more. Between cold and warm waters, there are hundreds of species of shrimp to choose from, and each species has its own unique taste. If you’re not familiar with shrimp or have never cooked it before, Robert Wholey Company is here to help. Explore our selection of frequently asked questions today to learn more about this appetizing decapod crustacean. How do you peel shrimp? Peeling your shrimp beforehand will result in a tastier and more attractive presentation. There are different ways to peel shrimp: completely peeled, tail-on or head-and-tail-on. The recipe you use should tell you what you need. Gently twist to remove the head if it’s still attached. Start underneath, where the legs are attached. Dig your thumb under the shell to release. Remove the tail with a gentle tug. How do you devein shrimp? Devein by making a shallow slit down the middle of the back to expose the black intestine. If butterflying, make the slit deeper. Lift out the black vein with the point of a paring knife and wipe it off on a paper towel. You can also rinse it out under cold running water. Do you need to remove the vein? The “vein” in a shrimp is actually a digestive tract that runs along the back of the shrimp just beneath the surface. Although veins aren’t necessarily harmful, they can be rather unsightly or add some grittiness to your shrimp recipe. Why don't you eat the shrimp tail? Most people avoid eating shrimp tails because the shell texture is unappealing, but you might consider eating the shrimp tail if the shrimp is deep-fried and crispy. Many cooks leave shrimp tails on for presentation purposes. How do you remove the tail from shrimp? Whether raw or cooked, simply pinch the tail where it meets the body of the shrimp and gently pull. How long does shrimp last? The shelf life of shrimp depends on the sell by date, preparation method, and storage method. How do you bread shrimp? Set up a breading station with separate bowls: one for an egg wash and a tablespoon of water, one for a blend of all-purpose flour, salt, pepper, and other seasonings, as well as a third bowl for breadcrumbs. 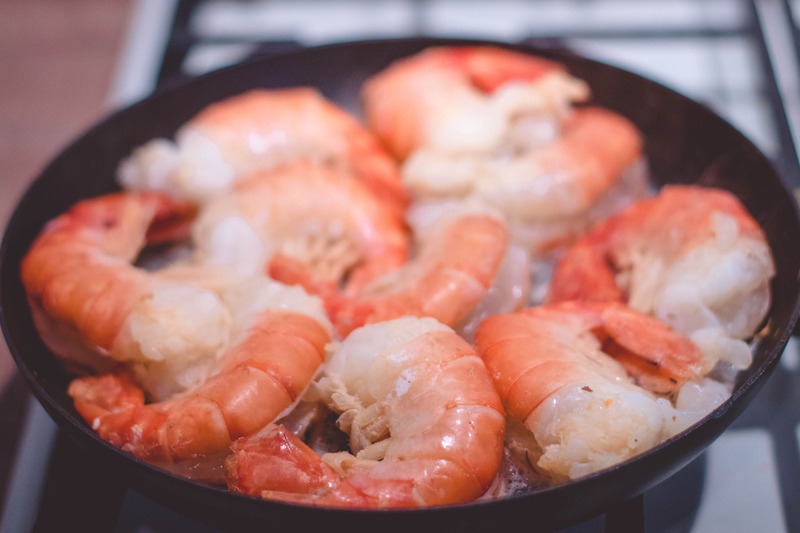 Once shrimp are peeled and deveined, take one shrimp to dredge in the seasoned flour mixture. Then coat the shrimp in the egg wash, and press gently into the breadcrumb mixture. Deep-fry for best results. If you can’t find the answer to your question or would like to learn more about the shrimp selection at Wholey’s Market, please contact us today to speak to a customer service representative for further assistance.